Vice President Joe Biden’s announcement on Wednesday that he would not run for president of the United States made it a foregone conclusion that the media would worship at the shrine of Hillary Clinton during her Benghazi testimony on Thursday. They have no other choice. The precious must be protected at all costs, which means covering up for her lies, her calculated obfuscations, and her charmless faux-gravity. Already the narrative has been set: Hillary Clinton was a victim of a political Benghazi committee dedicated to her destruction. Every Congressional committee in history has entailed some political motivation—would anyone argue that the Watergate investigations were completely apolitical?—but the media myopically focused on the idiotic comments of Rep. Kevin McCarthy (R-CA) before Hillary’s testimony, crafting the story of her victimization before it had even taken place. Hillary, as always, is the poor, put-upon victim of a vast right-wing conspiracy. She set up a private email server and deleted relevant emails from it for purely political reasons; she pressed for a pointless invasion of Libya for political reasons, chortled at its conquest for political reasons, watched it descend into chaos while doing nothing for political reasons, and then allowed her ambassador to twist in the Libyan tornado without proper security for political reasons; finally, she covered up that disaster by lying about its causes for political reasons. But those who ask questions about such matters are partisan politicians. But after 11 hours of lying—which is only slightly longer than the hours Hillary and her boss’ administration did virtually nothing as Americans died under fire in Benghazi—we may as well examine Hillary’s most important lies. Hillary Cared Deeply About the Human Cost. Hillary kept claiming that she cared deeply about her good friend Chris Stevens. At one point, she whipped out her pre-planned righteous indignation to complain, “I would imagine I’ve thought more about what happened than all of you put together. I’ve lost more sleep than all of you put together.” This was salt in the wound, the equivalent of Johnny Cochrane lamenting his worries over the fate of Nicole Brown Simpson. Hillary admitted in her testimony on Thursday that her good friend Chris Stevens did not have her private email address, and that she could recall no conversations with him after he became ambassador to Libya. The night of his death, she wrote an email with the subject line: “Chris Smith,” conflating his death with that of diplomat Sean Smith. She didn’t bother speaking with survivors of the attacks until days later. As to the notion that Hillary lost sleep, she apparently didn’t the night of the attack—she went home instead of sticking around at the State Department or heading over to the White House, because, she said, she had to prepare for what would be a rough rest of the week. She didn’t talk to then-Secretary of Defense Leon Panetta or Chairman of the Joint Chiefs of Staff Martin Dempsey. We do know that she spent the night alone, a fact which led her to chortle. Hillary may have lost sleep over her failures later—clearly, she spent some time coming up with lies about a YouTube video. Hillary Thought The Attacks Had Something to Do With a YouTube Video. In fact, Hillary told the Egyptian Prime Minister the day after the attacks, “We know the attack in Libya had nothing to do with the film. It was a planned attack. Not a protest.” Hillary tried to state that she had actually told people that some people were pinning the attack on the video, but she herself pinned the attacks on the YouTube video in videos released in Pakistan. She lied, because it was obvious that she had failed in her central duty to protect her diplomats in the most dangerous part of the world—a part of the world she had made more dangerous with her favorite invasion. Hillary Didn’t Use Sidney Blumenthal As an Advisor. Hillary Clinton had reams of email exchanges with hitman Sidney Blumenthal. Blumenthal had been banned from the Obama administration for his corruption and Clintonian loyalties. Hillary said that the emails were unsolicited. Rep. Trey Gowdy (R-SC) shot that idiocy down easily: “You wrote to him, ‘Thanks and please keep them coming,’ ‘Greetings from Kabul and thanks for keeping this stuff coming, any other info about it?’ ‘What are you hearing now?’” Hillary then tried to amend her statement by saying they began as unsolicited emails. Hillary used Blumenthal as an advisor, and she routinely corresponded with him. Any implication to the contrary is absolutely false. Hillary Was Transparent About Her Emails. Hillary insisted again on Thursday that she’d been fully transparent about her emails. Even the State Department has rejected that nonsense repeatedly. 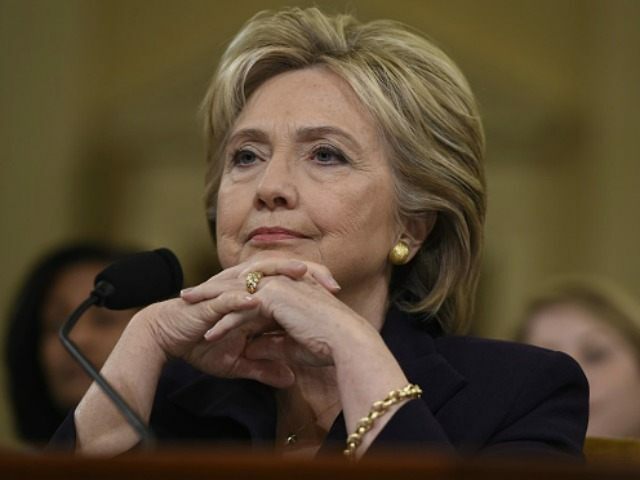 The hearings did provide some perspective into just why Hillary might have deleted 30,000 emails, however, she claimed that her correspondence about Libya, which dropped dramatically from 2011 to 2012, was not because she cared less about the country—it was because she had people shuttling documents to her in suitcases. In fact, she said, she didn’t even have a computer in her office. A State Department email address could have confirmed whether any of that was true. Now we will presumably never know. Chris Stevens Was Responsible for His Own Death. The most despicable lie of the day came from Hillary’s defense of her own conduct via ripping Chris Stevens, the dead ambassador. She spent virtually the entire day suggesting that Stevens knew the risks of his job, that he accepted those risks, and that he died knowing those risks. She even said that Stevens “felt comfortable” on the ground. If that is true, it’s certainly odd that the State Department team in Libya asked for more security over 600 times. Hillary said she didn’t receive any of those requests and blamed her security team for not granting more security—all the while saying she took responsibility for what had happened. Then, the capper: Hillary said that when Stevens wrote an email asking about whether the Benghazi compound would be closed, he was just being a sly jokester. She said, “One of the great attributes that Chris Stevens had was a really good sense of humor, and I just see him smiling as he’s typing this because it’s clearly in response to the email down below talking about picking up a few ‘fire sale items from the Brits.’” When told that those “fire sale items” were security barricades, Hillary answered, “Well, I thought it showed their entrepreneurial spirit.” Disgusting. But don’t worry—Hillary’s the victim. Republicans are the perpetrators. And Chris Stevens is just one more bump in the road on her journey to the White House.